Externalities are an integral part of South Africa's electricity power generation sector as the country is highly dependent on coal as the primary fuel source. While there have been significant efforts to account for the constantly increasing externalities in developed countries, it has not been the case in the developing world. This paper attempts to observe the trend of externalities research in South Africa's power generation sector and to analyse the gaps by placing externality research in context with other studies performed internationally. A statistical analysis adjusted for currency conversions puts into perspective the range of externalities. It also provides an overview of South Africa's energy supply and demand scene, with emphasis on the role of coal in the electricity sector. The paper provides motivation to perform a revised externality analysis along international lines. The aim is to add to the body of literature on externality studies in South Africa by providing an updated comparative analysis. This will enable future research to contextualise studies that were performed during different time periods. In a purely economic context an externality is a cost or benefit resulting from an economic transaction that is borne or received by parties not directly involved in the transaction and refers to the phenomenon that occurs when the social or economic actions of an individual or a group affect another individual or group (not necessarily in that order) in an unintentional and uncompensated manner.1 This effect can be either positive or negative and often goes unaccounted for. The positive external effects are often ignored from an action-oriented approach (because these are harmless) but are accounted for economically to enhance policymaking. On the other hand, negative externalities affect society adversely, both aesthetically and economically, essentially making their internalisation highly critical to the economy. Electricity generation is often accompanied by the emission of harmful pollutants (such as SO2, NOx and particulates) and greenhouse gas (CO2) when the technology involved uses fossil fuels. These emissions cause damage to humans as well as material assets, for example in the form of respiratory problems or structural degradation, respectively. These issues, when overlooked and neglected, affect the general population. Monetary accounting of these effects on the other hand increases the cost of electricity generation schemes with political and policy consequences. As the name suggests, non-market valuations are used when there are limited or non-existent markets for socially valued items, such as clean air, for which there is no market price and assigning a cost is usually subject to controversy. These techniques are prone to a certain amount of ambiguity as there are few references that can be fixed to the market. Three popular methods, among others, are used to evaluate these scenarios: the contingent valuation method, the travel cost method and the hedonic pricing method. The contingent valuation method involves directly asking people, usually in a survey, how they interpret the damage that has occurred or might occur to the environment. Contingent valuation methods are based on people's willingness to pay for an improved situation, or willingness to accept compensation for a worse situation.7 Contingent valuation methods fall under 'stated preference' methods, because they require people to state their values rather than approximate values from actual choices. The valuations are performed with an assumption that the public involved in the methodology have a fair idea about market dynamics. An example of such a scenario would be a situation in which inhabitants of a municipality are asked to decide on how much they would be willing to pay to conserve a fishing habitat. There could be a difference in the valuation depending on how an individual might prioritise fishing amongst their hobbies. However, this method is controversial as the monetisation of willingness in either context is subject to the individual's perception and ability. Also the willingness to pay and the willingness to accept compensation will differ between developed and developing economies based on nominal gross domestic product (GDP) and purchasing power parity.6 This difference can be explained by a comparison between a rich person and a poor person who have to pay the same amount for an improved environmental situation. The poor person will be more reluctant to part with the valuation than the richer person. This comparison can be extended to countries with different economic capabilities as well. The travel cost method is used mainly to evaluate values of recreational areas and places of leisure8 and is usually done by calculating expenses incurred while undertaking an activity of leisure. The method bases the valuation of a recreational area on how much people spend to get to the site. The travel cost method is classified as a 'revealed preference' method, because the costs are inferred from travel and choice patterns rather than from people stating how much they would pay. The travel cost method can be used to restructure the entrance fee, for example, to a zoo depending on the maintenance required. The results of the evaluation are fairly easy to interpret. The ambiguity occurs as the evaluation of a person's leisure time and expenditure has no fixed limit and is subject to preference. In other words, a person who enjoys visiting a zoo might travel there very often, thereby overestimating the value. As the application of the method suggests it is not suited for electricity externality valuation. The hedonic pricing method uses an environmental valuation based on market-related services and property. The idea behind the method is that the price of a market good is related to its characteristics or the services it provides. This methodology is often used to value environmental amenities that affect prices of residential properties. Thus, prices will reflect the value of a set of characteristics, including environmental characteristics that the public considers important when purchasing a piece of land. For example, this method can be used when all characteristics of the houses and neighbourhoods in an area are the same, except for the level of air pollution. If the population living in the area valued better air quality then the housing prices would vary accordingly. This method has the advantage of relating the valuation to the market, but falls short when extracting the environmental costs from the real market prices. In other words, the environmental benefits that can be estimated are limited to those benefits that are related to housing prices. Market externality valuation is prone to less ambiguity when reference can be made directly to costs involved in the market, for example damage caused by acidic deposition on a building can be calculated by the cost incurred to refurbish it. Two methods used to evaluate market costs are the abatement (control) cost method and the damage (opportunity) cost method. The damage (opportunity) cost method makes use of the actual costs and benefits of the externalities and of non-market externality evaluation within itself where necessary. This methodology values the actual damage rather than estimating what the damage might have been. Hence the method is more associated with real-world scenarios. One such situation would be evaluating the damage caused to both material and non-material assets by uncontrolled emission of pollutants from a power plant. The method is further divided into the top-down and the bottom-up approaches.10 The top-down approach makes use of total (e.g. pollutant) data and is divided further to estimate the specific pollutant damage contributions, which in turn are allocated to power plants. These damages are then converted to monetised damage costs. The drawback of such an approach is that neither site specificity nor the fuel cycle stages are considered.11 Examples of this approach can be found in Hohmeyer2,12, Ottinger et al.3, Ott13 and Faaij et al.14, who also performed a bottom-up analysis for comparative purposes. The bottom-up approach is probably the most reliable method to date. It takes into account site specificity and the fuel cycle. The approach follows the impact caused along the pathway of a particular pollutant and is also called the impact pathway approach. The criticism of the bottom-up approach is that it lacks validity in cases where data is not readily available and a pathway cannot be established.11 Moreover, the approach is highly data intensive. However, this approach 'gets the nod' ahead of others as it is more suited for electricity externalities10 and is the preferred choice in extensive studies.16,17 Other studies in which the bottom-up approach was used are those of van Horen7, the Oak Ridge National Laboratory and Resources for the Future18, Bhattacharyya19 and Maddison20. Current studies on externality evaluations include simulating and predicting the trends of externalities, and how they affect the electricity generation make up over the next few decades.21,22 Klaassen and Riahi22 inferred that there would be a decrease in the global GDP if stringent measures were to be taken to reduce the role of coal and gas generated electricity in favour of renewable technologies (e.g. wind, biomass and solar). 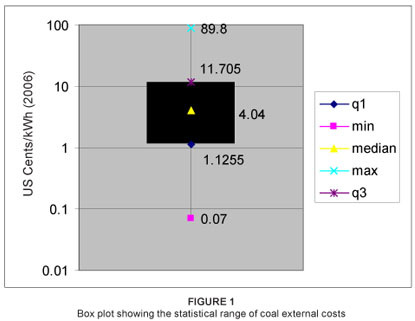 Table 1 shows a comparison of the external costs of different coal-fired electricity externality studies performed using different market valuation methods. As can be seen from Table 1, the result of the abatement (control) cost method contained a fair amount of uncertainty, because it was one of the earliest studies conducted and the authors had to overcome many data gaps. Uncertainties exist when the geographical area considered in the study is wide and when factors previously unaccounted for, such as the effect of CO2, are later accounted for.16 This disparity can be observed by comparing the results of the ExternE evaluations performed in 1995 and 1999. The differences between the studies are mentioned in the next section. The costs of the predictive studies are higher than the general average because of the contribution from the developing economies which do not employ desulphurisation or denitrification schemes on a large scale. Also the rate and scale at which the developing countries are expected to switch to renewable schemes are slower than the developed countries. The box plot in Figure 1, which shows the entire range of externality values used in Table 1 helps in understanding the values better. The valuations range from a low of 0.07 USc/kWh to a high of 89.8 USc/kWh with a median of 4.04 USc/kWh. The middle 50% (inter-quartile range) of the values range from 1.13 USc/kWh to 11.7 USc/kWh. The majority of the extensive externality evaluations have been performed in industrialised economies2,4,16 with a few being from developing economies.7,19,24 However, as the pace of industrialisation is faster than before in developing countries such as China, India, Brazil and South Africa, these countries are, or are becoming, major contributors to harmful emissions.25 Therefore there is an increased need to monitor externalities in these countries. The Stern review26 gives an international perspective into the near future on what could happen economically and socially if fossil fuel emissions are left unchecked. The review provides realistic and pragmatic solutions that are viable for national regulatory bodies to follow and calls for increased cooperation at an international level. This study was complemented by the long-term mitigation study27 performed locally. The long-term mitigation study considers two scenarios, one where emissions are left unchecked as per current economic growth patterns and the other where emissions are checked as means to ensure a sustainable emissions target for the future. The study attempts to arrive at solutions to bridge the gap between the two scenarios using realistic scientific and economical tools. It can be observed from Table 1 that there is a fair amount of methodological disparity in the results between the studies conducted in Europe and North America during the surge in externality valuation studies. This disparity led to a joint effort between the European Commission and US Department of Energy in 1991 called the 'EC/US Fuel Cycles Study', which had the aim of creating an accounting framework within which externalities could be referenced.7 The project consisted of a multi-disciplinary approach from both sides of the Atlantic and involved energy technologists, environmental scientists, health specialists, atmospheric chemists, ecologists and economists. The initial phase was completed in 1993. The project involved 5 European teams during the inception of the project, and by the time the US contribution was stopped there were at least 50 teams from 15 different countries in Europe. Since then there have been major advances in methodologies for assessment of the impact on soil and water in the impact pathway approach. These included the addition of improved dose-response functions in the Riskpoll software, which is a collection of impact assessment models designed to estimate health and environmental risks of classical pollutants such as SOx, NOx and CO and toxic metals such as As, Ni and Pb. The methodologies used during the earlier valuations were also updated.17 Contingent valuation methods were used to value changes in life expectancy. Current ExternE projects include the NEEDS (New Energy Externalities Development for Sustainability) and CASES (Cost Assessment for Sustainable Energy Systems) projects which were expected to be completed by the end of 2007 and 2008, respectively. The aim of the NEEDS project is to evaluate the total costs and benefits of energy policies and of future energy systems, at a level for individual countries (Brazil, India, China, etc.) and for the European Union as a whole. The CASES project will require results of the NEEDS project to perform the cost assessment. The South African industry is highly energy driven: 0.28 tons of oil equivalent (toe) was used to generate 1000 dollars (calculated according to rates for the year 2000) of the GDP in purchasing power parity in 2005,25 while the average for the OECD (Organisation for Economic Cooperation and Development) countries is 0.18 toe. The energy and electricity sectors are dominated by coal as the primary energy source. 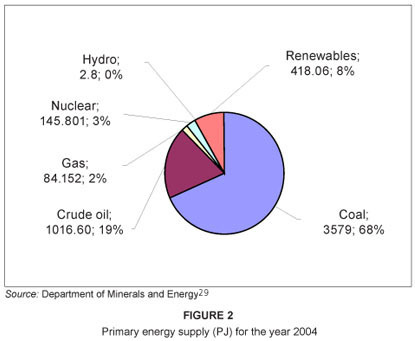 Figure 2 shows the total primary energy supply for the year 2004 which was 5240 PJ. It is evident that coal supply outstrips its nearest competitor (crude oil) by far. The primary energy entering the nation's energy system is converted into more useable forms which can be directly consumed. 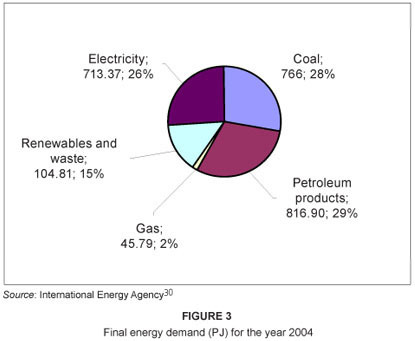 Figure 3 describes the final energy demand (2744 PJ). 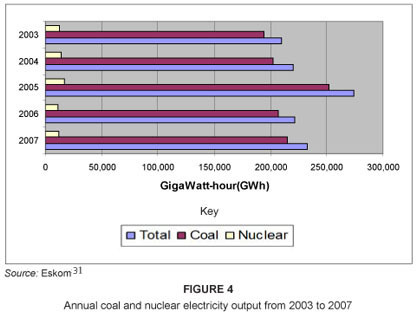 Figure 4 shows that the amount of coal-fired electricity has been increasing steadily while the amount of uranium-fired electricity is fluctuating. 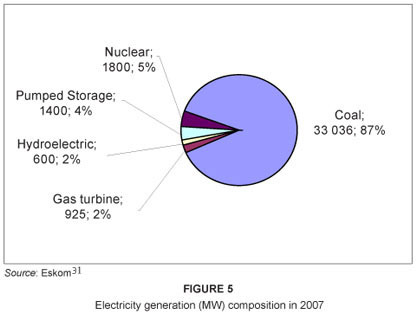 Eskom also uses other technologies (Figure 5) to generate electricity, but none, other than nuclear energy, contribute more than 4%. Recently, doubts have been cast over South Africa's coal reserves, originally estimated at 55 billion tons. The Department of Minerals and Energy is conducting an investigation to estimate the actual reserves, in the meantime using a temporary estimate of 38 billion tons.33 If the latter estimate is true, the initial estimates were overestimated by 45%. If the current consumption rates are to be followed the reserves would last for the next 200 years. However, it is predicted that with growth rates of 3% to 5%, the reserves would persist for only another 40 to 50 years.34 This observation calls for an increased effort to diversify the nation's electricity generation schemes. South Africa so far does not have solar or wind power generated electricity on the national electricity grid.35 However, there are local cases in which these technologies have been used.36 The challenge will be to phase out environmentally degrading generation schemes in favour of renewable energy while retaining the industrial and competitive edge provided by cheap electricity. The long-range energy and alternative planning (LEAP) model was used for South Africa37 to analyse the short-to long-term effects on the environment keeping in view the national socioeconomic framework. The long-term mitigation study27 also shows the need to diversify towards renewable methods of electricity generation to account for a sustainable national future. There have been only a few studies performed in South Africa to evaluate the issue of externalities. A brief discussion of these studies follows. Externalities were first discussed in South Africa by Pouris and Dutkiewicz38. A year later the first externality evaluation study was started by Dutkiewicz and de Villiers31 on four electricity generation cycles, namely, coal, nuclear, wind and solar. The study aimed at re-evaluating the generation cost table of different fuel cycles after internalisation of the external costs. This study was performed for the Energy branch of the Department of Minerals and Energy Affairs between March 1990 and September 1991. The methodology used was similar to that of Hohmeyer12 and Ottinger et al.3, who followed a top-down damage cost approach. The damage cost approach was found to be preferable over the other methods, for example the control cost approach and willingness to pay approach, because of the lack of prior quantification and differences in perceptions, respectively. This study considered the entire life cycle cost of the electricity generation systems based on other studies performed in developed countries.39,40 The results of the study showed costs that were at the lower end of the range of international studies7 (Table 2). The study concluded that possible improvements in the analysis could be made by evaluating the aesthetic effects (such as reduced visibility and noise pollution) of the externalities. This study was performed by Clive van Horen in 1996 with an emphasis on the coal and nuclear fuel cycle.7 The study was part of the second phase of the Industrial Strategy Project funded by Friedrich Ebert Stiftung of Germany, the Hummanistisch Instituut Voor Ontwikkelingsamewerking of the Netherlands, the International Development Research Centre of Canada and the Olaf Palme International Centre of Sweden to facilitate policy advice for the then newly elected government and trade unions. Van Horen used a bottom-up damage cost approach, which was possible because of the availability of site-specific data. This method found favour in cases where a study tried to cover multiple sites and estimate externalities from aggregated data. An externality modelling tool called EXMOD was used to evaluate air pollution impacts. EXMOD was developed for the RCG-Tellus study in the state of New York.23 The study brought to light that the nuclear industry was highly subsidised and played a major role in driving up the externalities (Table 2). The health hazards, though possibly significant, were not taken into account because of the stringent safety measures in place. The largest contributor to the coal externality was greenhouse gases and, to a lesser extent, health impacts from air pollution. Van Horen cited a few areas that required further investigation where possible, particularly the chronic and acute illnesses faced by coal miners, the impact of air pollution from ash dumps, the use of dose-response functions better suited for South African populations and improved evaluation of results of greenhouse gases emissions. 4.4 ZAc/kWh (actual externality) was 40% and 20% of the industrial and residential tariffs (1999 Eskom tariffs), respectively. The study showed a marked decrease in the subsidy provided to the nuclear industry.41 However, the nuclear external costs were not listed. The recommendations of the study shared van Horen's concerns and mentioned the need to expand externality valuations to other technologies such as gas-fired and renewable power generation. The authors also recommended a macro-economic analysis of the pros and cons of Eskom's decision to use low-quality coal for local electricity production. It can be seen from Table 2 that the results of the first study show valuations that are the lowest of the three. This could possibly have been because the study methodology was based mainly on international valuations done during the late 1970s and early 1980s,31 during which some factors could have been ignored owing to non-availability of data. The disparity in the costs of the nuclear sector was because of the subsidy to the nuclear industry taken into account by van Horen. Spalding-Fecher and Matibe's study had a lower externality valuation compared to that of van Horen's because of the inclusion of the positive effects of electrification and, in spite of not taking into account the nuclear externality, van Horen mentions a decrease in the subsidy provided to the nuclear industry. It has to be noted that while performing conversions from international studies to the local currency or vice versa the nominal exchange rate can often distort the true monetary value. An example of this situation can be observed in the paper by Sundqvist10 where he uses a 1996 exchange rate of ZAR2.47/USD1 to convert van Horen's externality values, while van Horen7 uses a 1994 exchange rate of ZAR3.66/USD1 in his study. These different values lead to a fair degree of uncertainty amongst policymakers. An alternative method of conversion that could possibly be used is the purchasing power parity exchange rate, which will decrease the variation in the exchange rates as they provide a better reflection of a currency's buying power. The use of the purchasing power parity rate has its detractors as it is calculated from the cost to purchase a set of basic food items and does not really cover a whole spectrum of goods, thereby not properly portraying the actual economic strength of the economy. Other South African externality studies have been conducted but none have necessarily focused on the externalities of electricity generation. Blignaut and de Wit42 provide a multi-sector analysis of the social costs of coal combustion in the form CO2 in the South African industry. They however did not include the effects of SOx, NO and particulate matter. Hence it was deemed appropriate not to include this study in the comparative analysis. Scorgie et al.37 conducted an extensive study to quantify the health effects because of air pollution caused by combustion of fossil fuels, both domestic and industrial. The study covers the main demographical centres (cities and municipalities) of South Africa. However monetary valuation of health effects was beyond the scope of their study and hence comparison with the results in Table 2 is not possible. A limited number of studies have investigated externalities in South Africa. The most extensive study is probably that of van Horen7 while Spalding-Fecher and Matibe41 presented new insight into the positive externalities. There were not any differences in the methodologies used for evaluating negative externalities except for the addition of new data. Van Horen's analysis included dose-response functions used by Rowe et al. 23, which dated back to the early 1990s. One area that could not be properly quantified was the impact of ash dumps on human health, mainly that of the workers in the mines and the environmental impact of the dumps on air, water and soil. The smoke dispersion model used within the EXMOD model uses a Gaussian plume model which is not perfectly applicable for South Africa.7 Re-evaluating the costs of various electricity generation technologies would require a thorough evaluation of renewable schemes such as solar and wind power generation. The externality analysis performed by Dutkiewicz and de Villiers31 on the solar and wind technologies relied on international data for assumed local infrastructure. A realistic analysis can only be performed once South Africa has solar and wind powered electricity supplied on the national grid. Ideally, future South African analysis should include the latest possible functions and methodologies among prominent international evaluations. This suggests an analysis preferably along the lines of the ExternE project. Also, because the methodology and parts of the data sets are more than a decade old, an update of the entire analysis would be beneficial. A major motivation for an externality analysis from a policy point of view is the South African government's need to diversify the electricity sector in order to allow renewable energy sources to play a bigger role in electricity sector generation.43,44 However, it is worth mentioning that, in spite of being a developing country, South Africa has made reasonable attempts to evaluate electricity externalities considering the significance of coal in the local electricity sector.